- Today's podcast was sponsored by Ava, a way to understand your body. Wear the Ava bracelet at night for insight about your fertility and health. 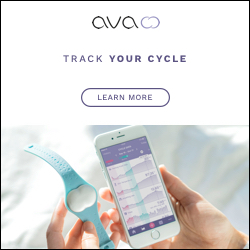 Check out this new clinically proven way to track your cycle here. - I first encountered Connie though an episode of the 'Made For Love Catholic Podcast' from the USCCB. You can listen to that episode - 'Love that is Fruitful in Infertility' here! - You'll love Connie's blog, 'Tales from the Valley', where she blogs about her experience as a Catholic woman who experiences infertility. - Connie's experience with infertility includes MRKH. You can find more about MRKH here. If you (or someone you know!) who is Catholic and has MRKH, Connie's blog is such a place of encouragement. Contact her to find out more about a secret group on Facebook for women who experience MRKH. - Connie and I mention a quote from St. Josemaria Escriva on infertility. You can find that quote and Connie's thoughts on the saint's wisdom over here at her blog post, 'Saint Josemaria on Marriage and Infertility'. - Connie and I both loved Haley Stewart's blog post 'Things You Don’t Have to Do to Be a Holy Catholic Woman'. - A book that Joseph and I found incredibly helpful when it came to discerning adoption is Adoption: Room for One More, which is published by Pauline Books and Media. - Current research has shown that the stress levels of women with infertility are equivalent to women with cancer, AIDS or heart disease, so there is no question about infertility resulting in enormous stress. You can read more about the impact of infertility on women's hearts and minds here.